Another studio photo - I'm working away trying to get a set of backdrops finished and dried (not too much of an issue in this heat) so I can concentrate on constructing the paintings - deciding what imagery to paint on each retablo. 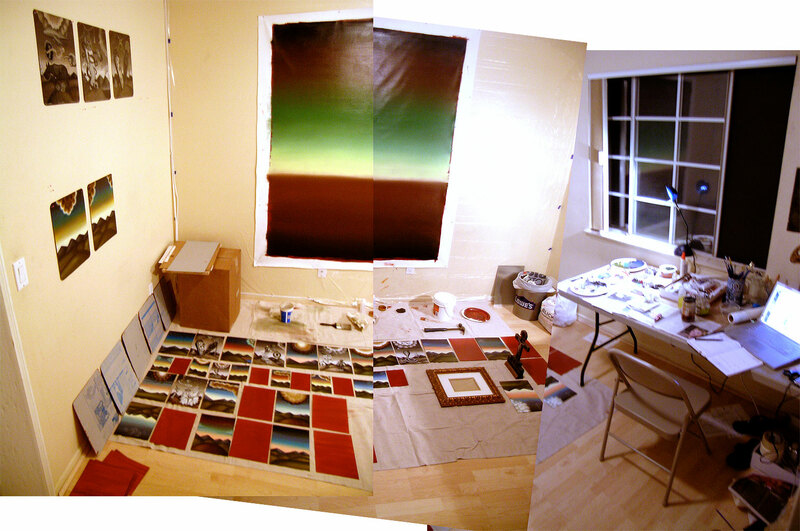 Often, it changes halfway through the painting. You just got to let it do what it needs to do without forcing it. That's happened with the backdrops too. I was using images from my Thirty-Three exhibition from mid 2009 to base the backdrops on, but once I got into a rhythm, I was making up mew types of cloud-forms, new colour combinations and even decided to do an upside down saint for NZ. The red retablos will be painted in monochrome and will be paired with the colour ones so there wil be a colour one and a black and white one (just it keep it clear). I've been enjoying painting the monochrome ones, so I thought I'd do some more. I'ts a different kind of focus when you're not dealing with colour.